Being a Supernumerary may seem like a simple task. After all, it is the best part of being in an opera without singing. It is actually quite challenging, but not for the reasons you might think. Yes, the hoop skirt is not the easiest thing to maneuver. 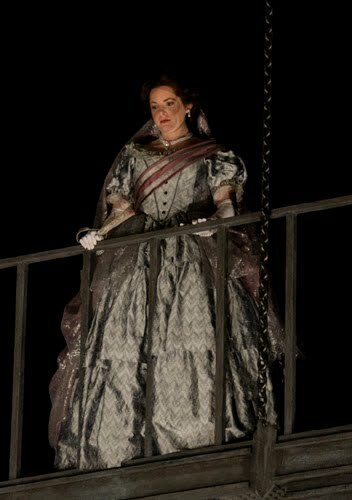 It seems like a physical impossibility when my fellow super and I have to get ourselves up the spiral staircase with fans and champagne in hand in Act 2. After many trips (literally) up the stairs we have managed to make our way up to the top balcony with a certain amount of grace. The hardest part of being a super for me is staying in character but not getting overly emotionally mired into the scene. When Edgardo busts into the party I can’t help but feel joy for Lucia. He has returned for her, (albeit a little too late) but I am supposed to look shocked that he is there...not happy that he has come for his true love. 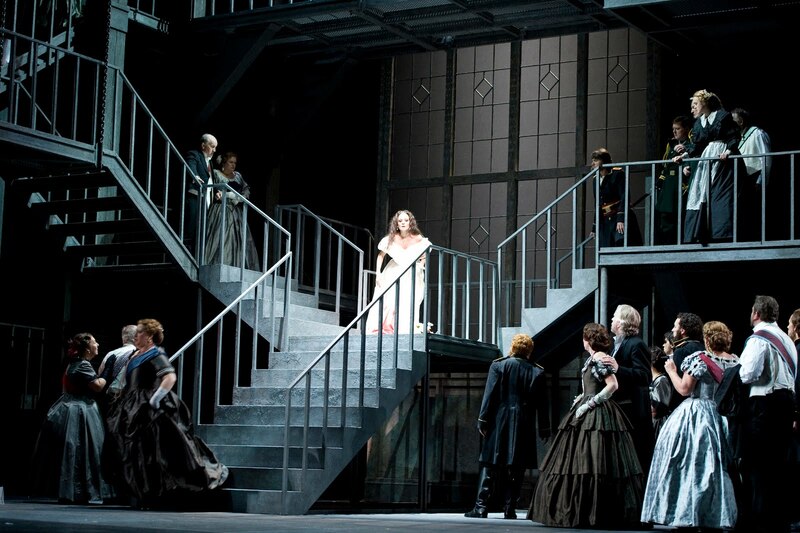 Or later, in Act 3 as Lucia is going insane, I am supposed to look on her with shock and disgust on my face as she sings the most beautiful, lilting high notes. Bill Burden is a superhero. I am convinced of it. The moment he walked in to our first rehearsal, with a smile on his face...I swear to you I saw a gleam shine from his teeth and heard a chime ring in my head. The scuffling terror you see in the mad scene is real. These ladies fully immerse themselves in the character of Lucia. Each night their performances are a little different, so we never know when Lucia is going to get in our faces or come running across the stage. There have been a couple of times when the blood is flying and we are all trying to avoid getting hit. One night in particular, our Lucia was gesticulating wildly with the knife in her hand and some blood had landed on one of the other Supers--right in the middle of his forehead. He turned to me and pointed out the drop of blood which by this time was running down his face. I had a very difficult time containing my laughter. There are moments that are truly magical. Most often, those moments happen in the infamous “Mad Scene”. We see our Lucia at her most vulnerable and transparent. I can’t help but feel pity for the girl as she comes unhinged mentally after feeling that she has been deserted by everyone she loves. Add to that the beautiful music that both singers perform in awe-inspiring fashion: I find myself holding my breath at times it is so beautiful. I sense that we all, audience included, are completely entranced by the end of the mad scene because we have collectively witnessed something truly beautiful. I look forward to every performance knowing that I will get to share in a special moment again. "I saw a gleam shine from [Bill Burden's] teeth and heard a chime ring in my head." CHING! Wonderful! As a recent newcomer to this blog site I would like to say how impressed I am with the articles that are posted here. This latest addition is no exception. 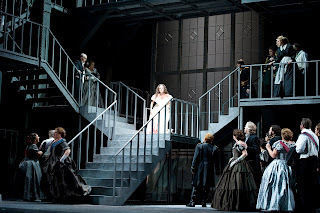 It is so good to read the various different insights into the workings of the Seattle Opera, and, although I am based in the UK, I hope one day to visit and partake of it in person. Keep up the excellent work! Thanks for reading! And come check us out when you're in Seattle. Thank you kindly - I will one day!